The new Footlogix packaging presents a more informative and highly efficacious look. 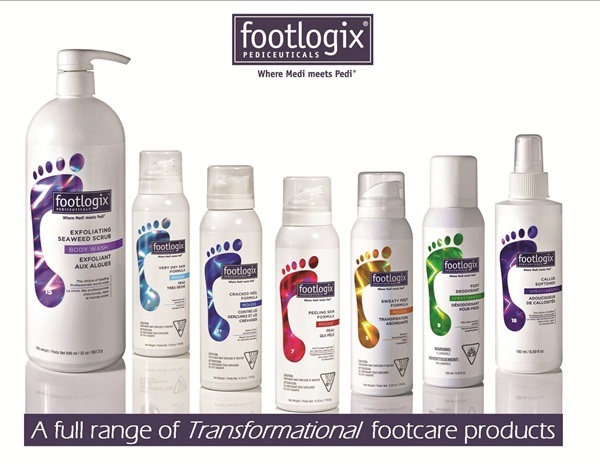 Footlogix Pediceuticals has redesigned its branding and packaging to feature bold, holographic labels. The foot care product line revitalized its look with the new premium packaging. The shimmering- holographic foil labels also feature updated product names and segmentation into five distinct categories. The new Footlogix packaging presents a more informative and highly efficacious look, and features a super-sized foot icon with a bold and simplified color coding system that now clearly identifies each product based on usage and application. Whether in the back-bar or displayed on shelves in key retail areas, the distinctive new look of Footlogix Pediceuticals will create an even stronger shelf-impact and will heighten customer interest as it continues to roll-out to spas and salons.